-extremely dangerous for pilots and their flight crews. -by loading tons of jet fuel. -it is called NOMEX® , made by DuPont®. 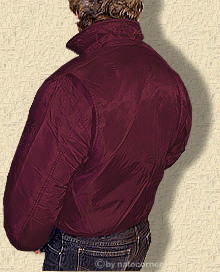 Further risk by flying a high perfomanced jet-engine is the loss of any contents out of the jacket´s pockets (e.g. MA1) and cause for FOREIGN-OBJECT-DAMAGE (FOD). By the way it was also time for a new stylish of the MA1 flight jacket. a new flight jacket was born. The CWU 45/P more stylish cut was enhanced by the practical deep side pockets with Velcro® secured flaps, which inhibit the loss of any contents. since the leather flight jackets from World War II. 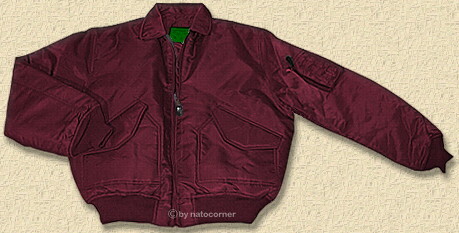 Our CWU burgundy flight jacket was produced till the end of the 90´s. These jackets are worked up with 100% us.mil.spec.norm. Material and workmanship is the best you can get, except the mil. 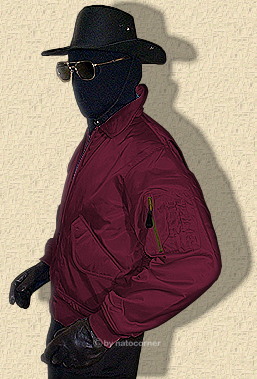 version of the NOMEX® CWU. -but our us.mil.spec. CWU´s are the genuine issue in quality, look and sensation. wasn´t used for the outer skin. but still the first choice. Our us.mil.spec. CWU burgundy jacket is made of DuPont® 6-6 NYLON flight satin, water repellent and even worked up more sturdily than the civilian CWU according to processing and quality of the material. All works are done following the orig.mil.spec. USAF pattern. The softly worked up inner lining consists of DuPont®-NYLON and isn´t lined with cotton wool but with a special kind of synthetic downy feather -named "ideal" holow fibre. To avoid the capillaries effects, the holow fibre is worked up with silicone. Additionally the lining isn´t simply put in but solidly sewn up. For highest comfort the flared back is pleated with two folds. The knitted waistband and cuffs are worked up doubly with sturdy and steady elastic fibre. The tops of the two outer, deep side pockets with Velcro® secured flaps, were cut at a rakish of 40 degrees, which further inhibits loss of contents. By the way, this design was also conducive to allowing aviators to put their hands in their pockets in cold weather. complete our CWU 45/P jacket. and still for other societies we are able to embroider high quality logos and insignias. Standard is our "SECURITY" or "POLICE" logo. "SECURITY" for example, is backstitched and made by more than 35.000 stitches. Commercial quality embroider is flatstitched, these logos are usually made by nearly 8.000 stitches, a very fast and cheap proccessing. Flatstitching is a kind of inferior workmanship and will be damaged by normal use in shortest time. Our high quality embroidery is rugged enough for working and sharp enough for duty. "SECURITY" or "POLICE" insignia are made of our standard colours in white or black. But we are pleased to offer numerous colours for all kinds of logos specially made for customers orders. For further information, please klick here.